C646 is an inhibitor for histone acetyltransferase p300 and may be a potential candidate for treating AML1-ETO (AE) positive acute myeloid leukemia (AML). It is shown that C646 inhibited cellular proliferation, reduced colony formation, evoked partial cell cycle arrest in the G1 phase, and induced apoptosis in AE-positive AML cell lines and primary blasts isolated from leukemic mice and AML patients.
. Bowers EM, et al. Virtual ligand screening of the p300/CBP histone acetyltransferase: identification of a selective small molecule inhibitor. Chem Biol. 2010 May 28;17(5):471-82.
. Oike T, et al. 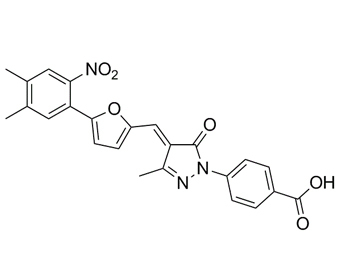 C646, a selective small molecule inhibitor of histone acetyltransferase p300, radiosensitizes lung cancer cells by enhancing mitotic catastrophe. Radiother Oncol. 2014 May;111(2):222-7.
. Zheng WW, et al. EDAG positively regulates erythroid differentiation and modifies GATA1 acetylation through recruiting p300. Stem Cells. 2014 Aug;32(8):2278-89.